Hillary Clinton hasn’t told Bernie Sanders to drop out of the Democratic primary, but some of her strongest supporters have told him that his continued candidacy is a futile task. The latest Clinton supporter to tell Sanders to “give up” is House Minority Leader Harry Reid who spoke to the Associated Press about the primary race. 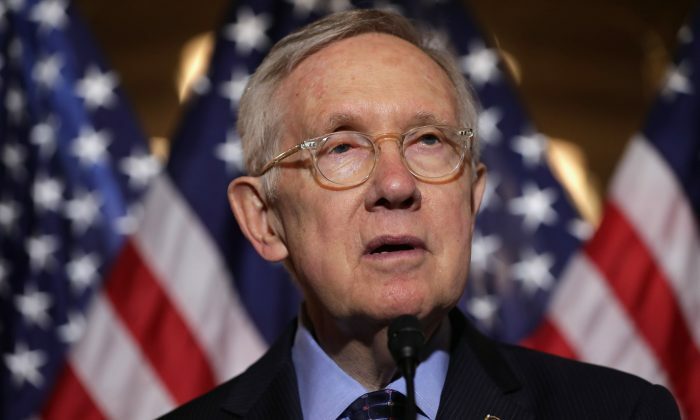 Reid, who’s endorsed Hillary Clinton, said that while Sanders has the right to continue running the race up until the Philadelphia convention in July, he should bow out before then. Sanders is disputing the suggestion that Clinton will be able to claim to have effectively clinched the nomination after next week’s primaries. He says that’s because Clinton’s delegate totals will include “superdelegates,” the party leaders selected by Democratic officials instead of voters. Sanders is hoping he can win California and change the minds of some superdelegates now backing Clinton. Two polls, the NBC/WSJ/Marist and Field polls released on June 2 show Clinton and Sanders within two percent in California—and if you include the PPIC poll—three out of the last four polls have shown Clinton leading by 2 points. The NBC poll shows a 49-47 split; the Field poll shows a 45-43 split; the PPIC poll shows a 46-44 split. The KABC/SurveyUSA poll shows Clinton up by a much larger margin, 18 percent; 57-39 percent. A Sanders win in California would be embarrassing for Clinton, whose husband won the California primary during the 1992 cycle to solidify his nomination against the current California governor Jerry Brown. Brown, who recently endorsed Hillary Clinton, also said he was “deeply impressed” by Sanders for his campaign, which is similar to the campaign he ran in 1992. Even if she doesn’t win in California, the proportional delegate system should give her enough delegates to surpass the threshold and receive a majority of delegates, although that victory would be muted by the upset.